"The acquittal yesterday of Dutch anti-Islamic politician Geert Wilders on charges of inciting hatred," reports The Independent (UK), "has split the Netherlands down the middle as effectively as the populist MP's right-wing rhetoric." The report about the acquittal of Geert Wilders noted that the judge "ruled that some of Mr Wilders' comments may have been "crude and denigrating" but they did not amount to inciting hatred against Muslims and remained within the boundaries of free speech." Wilders's final remarks in his Amsterdam trial were powerful. You can watch a video Wilders' closing remarks on YouTube (in Dutch with English subtitles). The Independent report quoted a sociologist in Amsterdam as saying that Wilders "has been told that he has been rude and offensive but it is on the border of what the criminal law allows. It is good. The Netherlands is, after all, a tolerant country and we should keep it that way." 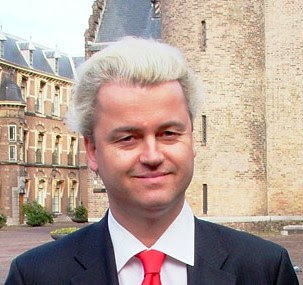 Wilders went on trial in October 2010 because he compared the Koran with Adolf Hitler's "Mein Kampf." In Geert Wilders' closing statement, reports Der Spiegel, he "said that his controversial statements against Islam were protected by the right to free speech. Wilders said he believed the process of Islamization presents a threat to Europe and that it is his right and duty to warn the public about it. If he had been convicted, Wilders could have faced up to one year in jail or a fine of up to €7,600 ($10,865). At the peak of the controversy over his statements, Wilders was once even banned from entering the United Kingdom."